OK folks, here it is: The best recipe for a deer’s front shoulder I’ve yet to find. Mexican barbacoa, a mildly spicy, long-braised variant on barbecue works perfectly with the tough, sinewy front legs on a deer, or really any animal. Historically I’ve mostly used front legs for stew and for grinding, but this is even better. The meat cooks very slowly, and all that connective tissue dissolves into the broth and makes everything richer and just a little slick. Keeps your lips shiny. 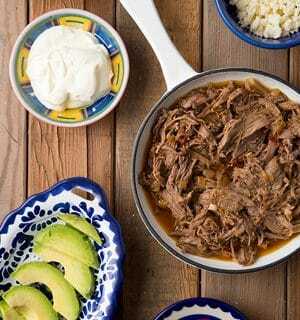 Barbacoa, if you’ve never had it, is more warming than picante. Yes, there are chipotles in adobo in it, which can be bought in every Latin market I’ve ever been in, but not so many that your head blows off. The cloves are a stronger element, as are the cumin and bay. 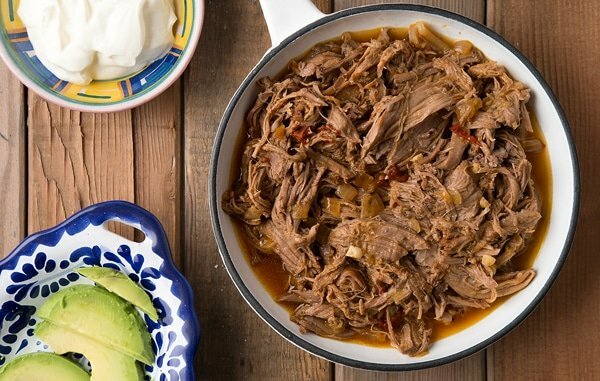 If you want to test this recipe before making it, go to your nearest Chipotle restaurant and try their barbacoa: this recipe is virtually identical. Serve it in tacos, burritos or over rice. And be sure to have at least a few of the traditional accompaniments, like cilantro, crumbled queso seco cheese, chopped onions, sour cream, fresh or pickled chiles, avocados — basically anything that works well on a taco. Still not convinced? Well, barbacoa may well be in the Top 5 Easiest Recipes on this website. It’s literally a crockpot-it-and-go dish. Minimal chopping, and the only thing you need to do as a cook is to shred the meat. Want to up your barbacoa game even more? Smoke your venison neck, shanks or shoulder first. Real simple, just salt it well let it sit overnight, then smoke it for a few hours at about 200°F. Then proceed with the recipe. You’re welcome. No, seriously, doing this makes your barbacoa smack-yo-momma-in-the-face good! Stupid crazy easy. Try it and you will not be sad. If you want a hot-weather variant of this recipe, try my Venison Yucatan. One more thing: This stuff reheats beautifully, so make a big batch. This is maybe the best recipe ever for the front shoulders of deer, which can be sinewy and tough to deal with. Cooking with this method really lets nature take its course, and all that connective tissue will dissolve and the meat will be super tender. But it will still be really lean, so I add about 1/4 cup of lard, bear fat or duck fat to the shredded venison before I serve. You would use olive or vegetable oil. Of course, if you use fatty meats like beef or lamb or pork, you won't need to do this. Put everything in a slow cooker or Dutch oven and cook, covered, until the meat falls off the bone, which will be between 2 hours (for many domestic meats and young deer) and 6 hours if you have a very old animal. If you use a slow cooker, set it to “high.” If you use a regular pot, put it into the oven set to 300°F. Pull all the meat from the bones and shred with forks or your fingers. Stir in the lard and as much smoked salt as you want. You want the lard or oil to coat the shreds of meat. Pour over some of the juices from the pot and put the meat in a pan for the table. Serve with tacos, in a burrito or on a bun. Have lots of accompaniments for your barbacoa: It's a base for a meal, the do-it-yourself construction of your tacos is more than half the fun! 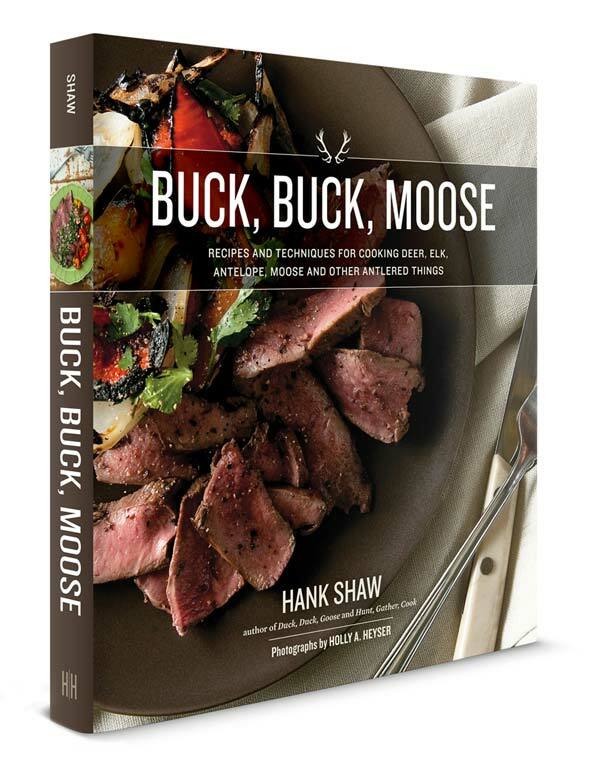 Explore nearly 100 other recipes for all kinds and all cuts of venison, right here on Hunter Angler Gardener Cook! I had my venison processed professionally and as a result it is all packaged as boneless cuts. What cuts should I try to use for this recipe? 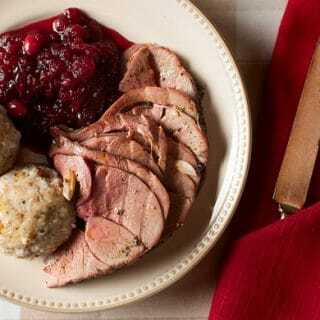 Jim: Stew meat would be my first choice. Would 2 pounds of venison “rump steaks” work with this recipe? It sounds awesome! Anthony: Yep, that would work. Made this over the weekend, yet again. Love it. Great use for the front legs, which, compared to the rump, add little meat and lots of rubbery bits to what goes in the grinder. My wife gave it a big thumbs-up, which is not in insignificant endorsement!